With this requirement, I looked at various options to head to Mumbai. It so turned that flights were not too expensive compared to buses. I glanced through various options, based on pricing and timings. I had the option of flying out on Friday evening, or on Saturday morning. Friday evening flights were priced out, while Saturday morning flights - a little later morning ones - were well within my range. It finally boiled down to a tie between India's largest airline (in terms of passengers carried) and India's newest Full-Service carrier. The former was cheaper - but consider the added convenience fee, and cost of buying anything on-board, selecting the latter made sense. And it also made sense to select the latter, because I can "fly the new feeling". 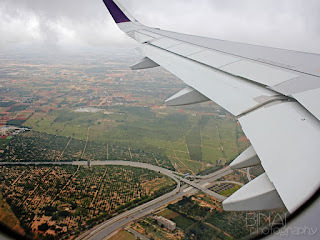 So Vistara it was! It was a rather early start to my day - I got up just past 5am, and rushed through with my morning chores. I was all set to leave home by 6.15am. I booked an Uber, which dropped in by 6.30am. 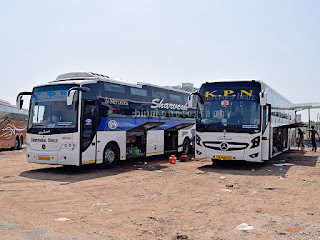 The cab dropped me at Shantinagar bus station by 6.55am - I had a particular bus in mind, and decided to wait for that. It never turned up (it actually left long before I reached there) - and hence got into a Vayu Vajra sometime around 0720 - Vayu Vajras are a bit heavy on the pocket. The bus left me at the airport just past 0800. I had over two hours to go for my flight, and hence spent some time clicking around the terminal. 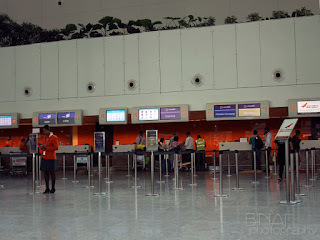 As the clock ticked past 0810, I decided to get into the terminal, check-in my baggage and then roam around freely. The CISF guard at the gate had a smile on seeing my 10 year old photograph on the PAN card, and let me in to the terminal. 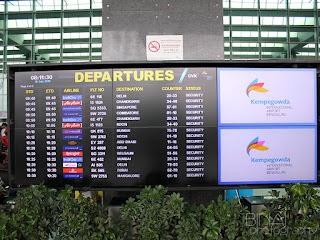 The FIDS - showing my flight.. 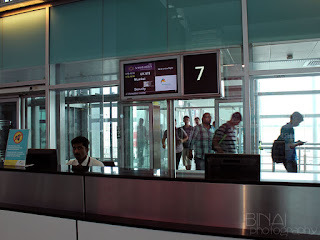 I had to figure out where the Vistara counters were - Vistara counters are located right next to the Air India counters, at #75-#78. 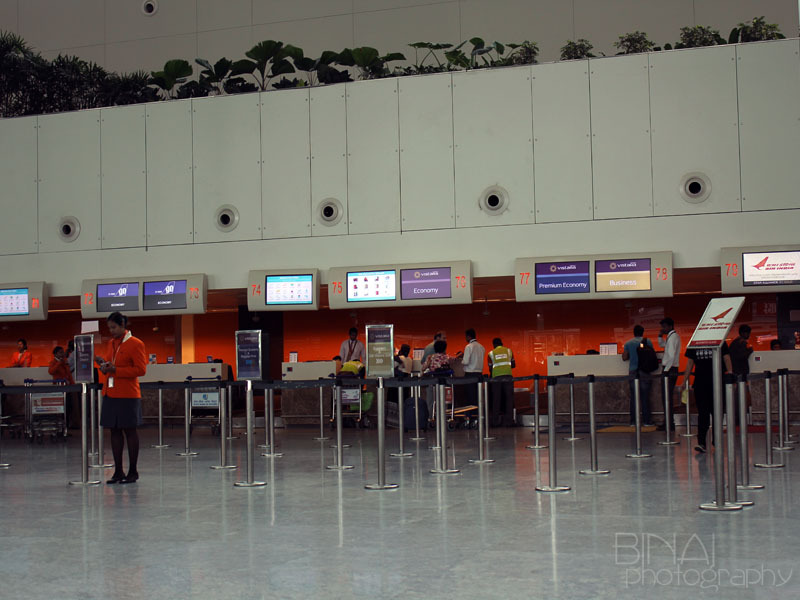 The counters are manned by AI-SATS employees, in the typical AI-SATS Orange uniforms. A lady at the entry to the check-in queue, welcomed me with a Namaste, Welcome to Vistara address, and led me to the economy check-in queue. 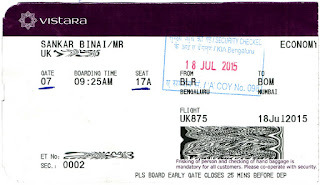 I got my boarding pass by 0818 and headed towards security check. 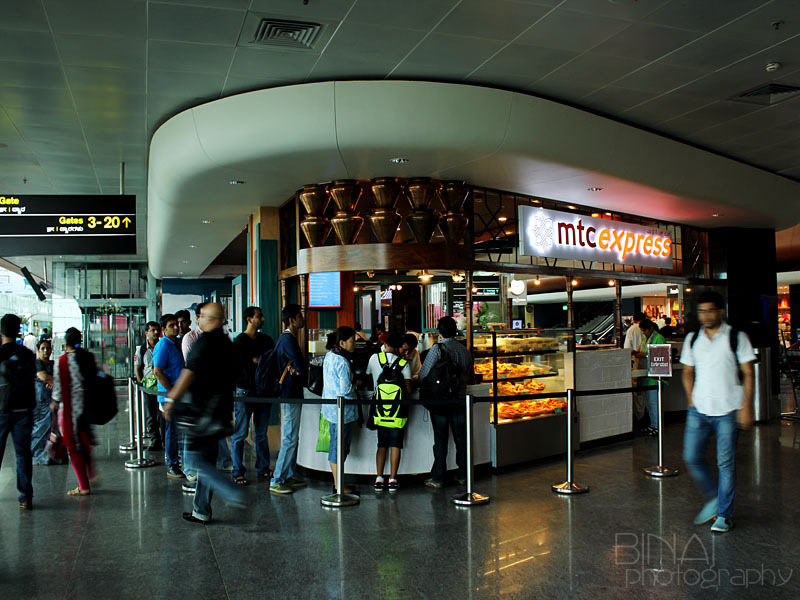 I had lots of time to kill, and hence headed to MTC Express for a light breakfast, after security. 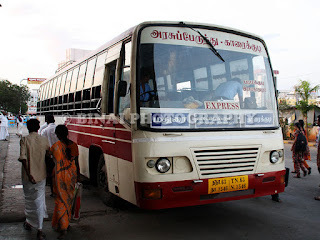 I figured out this time that it would be better to head to MTC than MTC Express - the former has better choices than the latter. I'd surely try MTC next time. Oh, by the way, MTC is the good old Malgudi Tiffin Centre, who in search of youthfulness renamed themselves. People don't really understand the value of a name like Malgudi - and then try to project themselves as young with gory abbreviations. Whatever... I'd have surely preferred retaining the old world charm, Malgudi, than sounding like Chennai's Metropolitan Transport Corporation (MTC). The rebranded Malgudi Expres.. now "MTC Express"
After my breakfast, I headed towards the waiting area near Gate #1 - where one can have a great view of the apron, and the aircrafts clearing the runway and entering the apron. 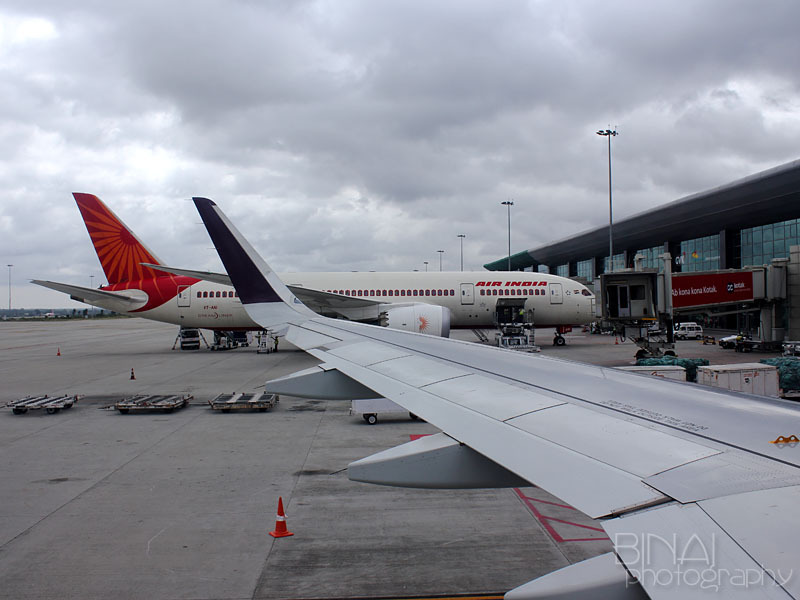 Just as I reached there, I saw Air India's Dreamliner (VT-ANI) exiting the runway - my first sight of a dreamliner in full view. On all the previous occasions, I could catch only glimpses of the dreamliner. When I saw the dreamliner, I remembered that my aircraft should also be around. 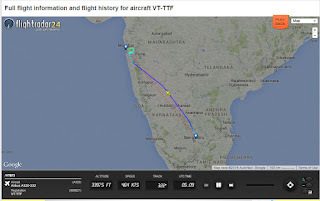 I quickly hooked on to FR24, and understood that my aircraft (VT-TTF) was on the finals. A minute later, I saw her exiting the runway (0909). 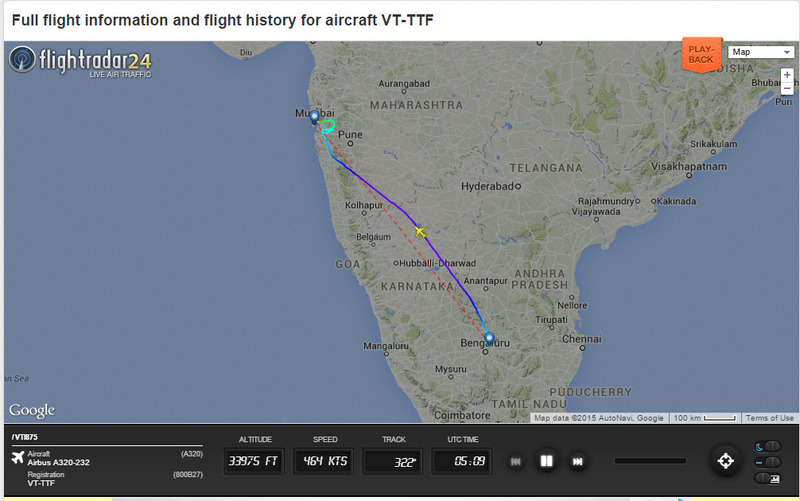 And guess what, Air Asia's JRD Tata commemorative jet, VT-JRT, was right behind. That was surely my day! I headed to my gate, since I wanted to know the loads on the inbound. I was quite thrilled to see VT-ANI docked at the next gate as well. The loads in the inbound for my flight seemed good - the aircraft works DEL-BLR-BOM-BLR-DEL - a very relaxed and lazy rotation. Boarding was called at 0930hrs. 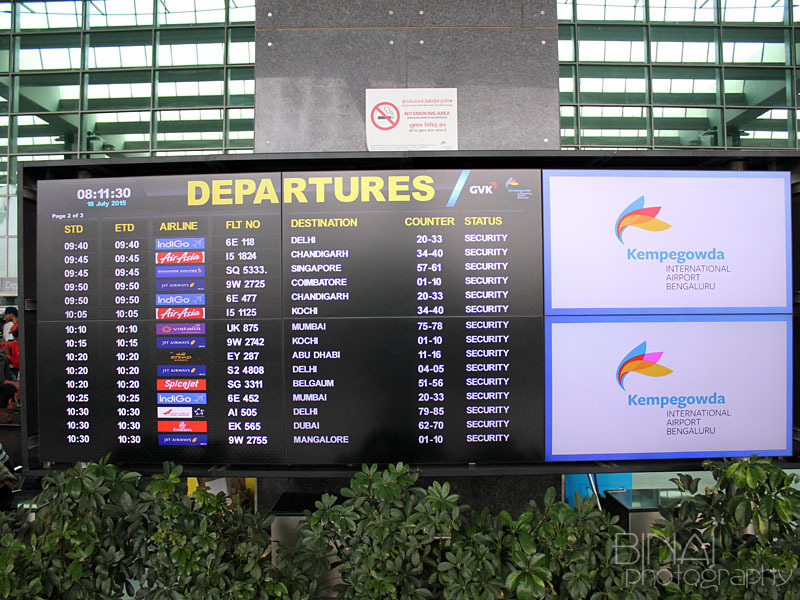 They created seperate boarding zones by seat numbers and class. Business and Premium Economy passengers could board whenever they liked, while economy boarding was regulated by seat numbers. Initially passengers in the rear rows were called, followed by the forward rows. I passed the gate at 0939 - there were multiple layers of checking on the way to the aircraft. 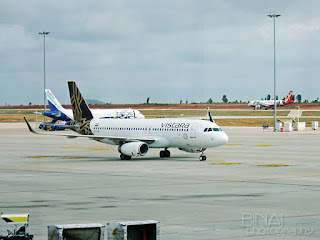 First by the gate agent, then by the CISF guard, then by another Vistara agent, and finally by a Vistara security guard. The boarding pass stub was detached at the third level, while the guard at the fourth level verified whether my hand baggage had a security clearance. After checking, he also wished a great journey. Christina was at the door, who welcomed all passengers with very warmly. Business was absolutely empty, premium economy was 50% full, while economy had only a couple of empty seats. I took my seat by 0945, and boarding was officially completed by 0950. 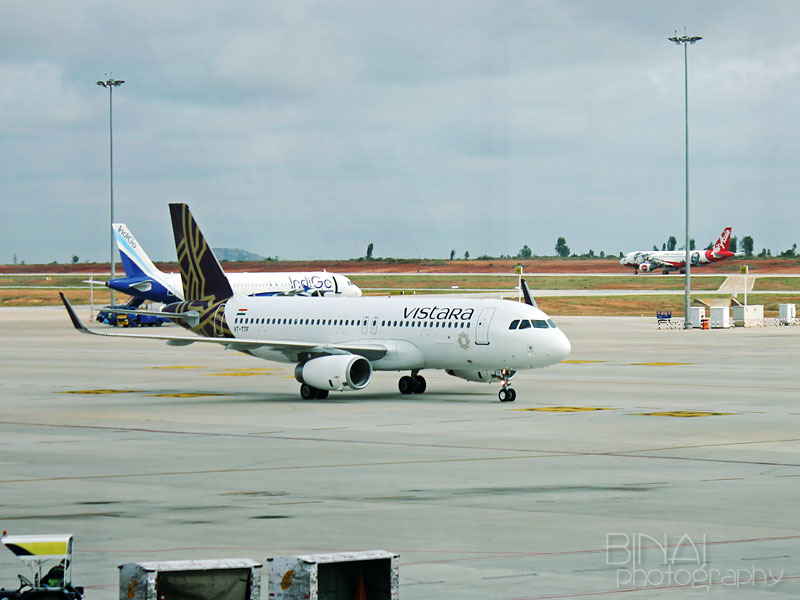 Ground staff of Vistara quickly performed a headcount. 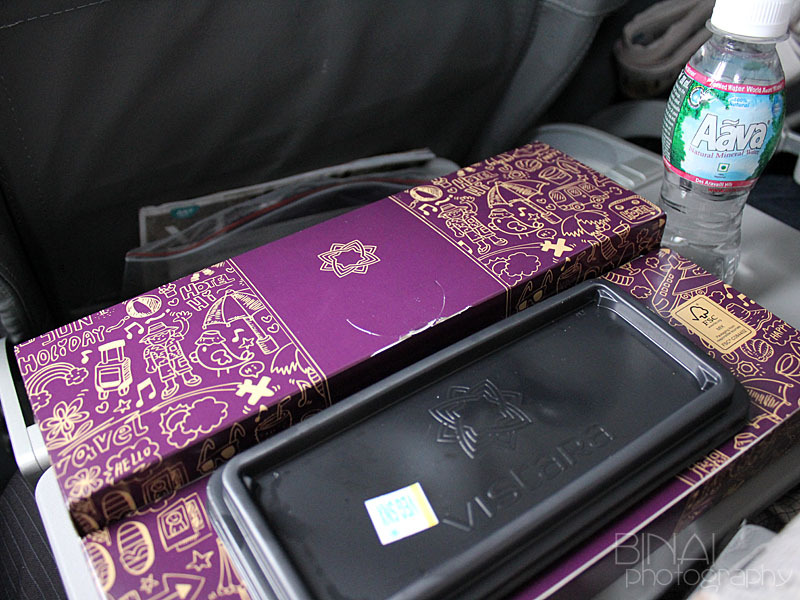 While premium economy passengers received their welcome drink, passengers in Economy were served water in bottles. Door was armed at 0955, and security demonstration began. Christina was the purser. At the deck were Capt Bhagchand and first officer Capt Guru Pratap. There were three other flight attendants, in addition to Christina. I got the name of two - Pushpa and Ruma. We were pushed back at 0958. 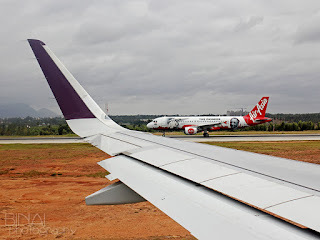 As we were powering up, an Indigo A320, and Air Asia's VT-JRT went past us towards the runway. We commenced taxi at 1002 hrs - it was a fairly long taxi to Rwy27. 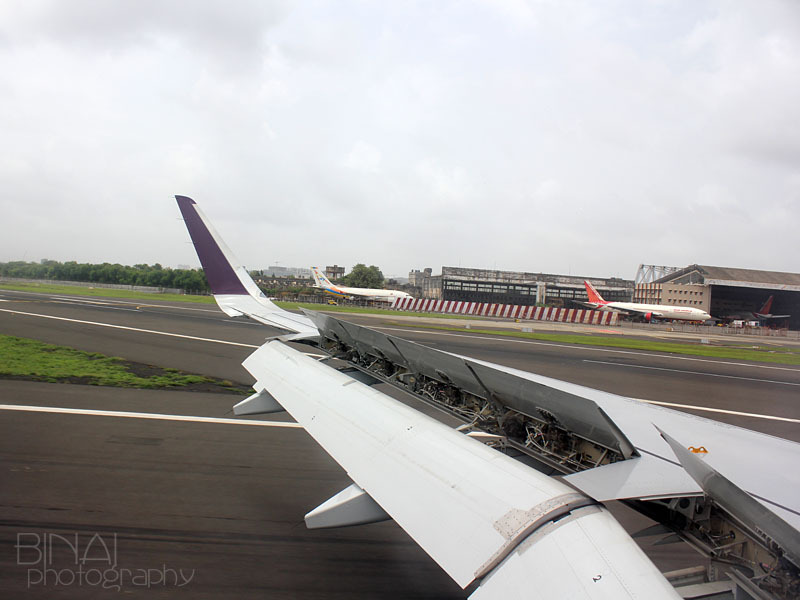 We reached the holding point of Rwy27 at 1007hrs. 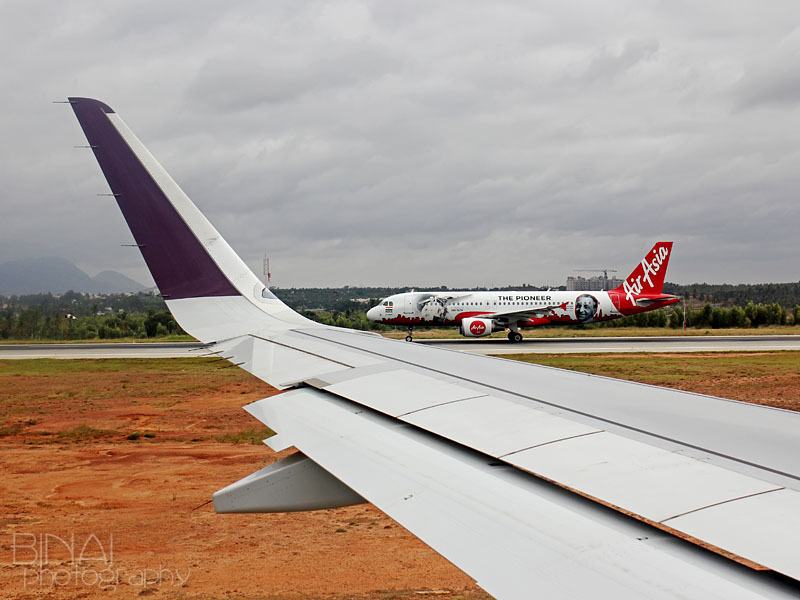 While taxiing, Air Costa's E-190, Air Pegasus ATR-72 landed, while Air Asia's VT-JRT took off. 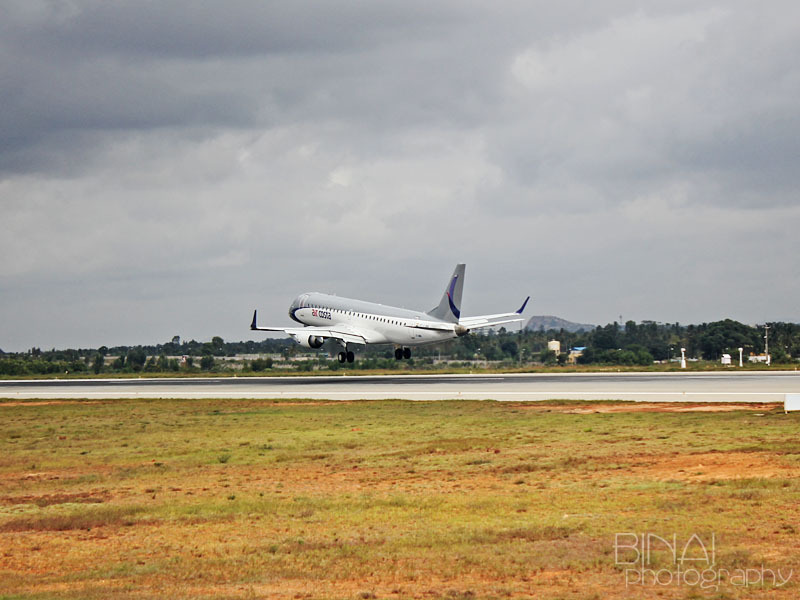 After we reached the holding point, another E-190 of Air Costa landed. 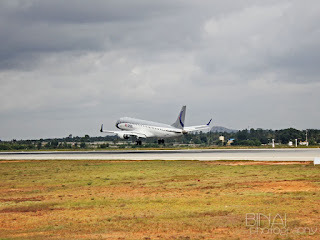 We were cleared soon after the Air Costa E-190 touched down. We finally took off at 1009hrs, from Runway #27. It was one sharp climb - we climbed soon, cutting through a fairly thick cloud cover. The seatbelt was turned off at 1012hrs. 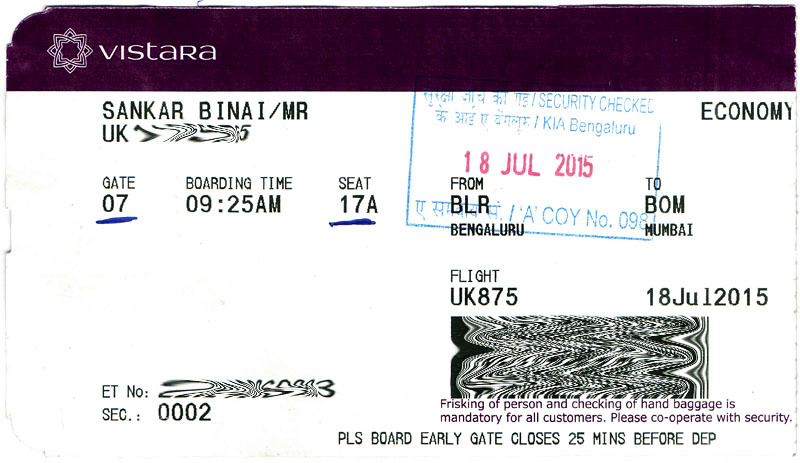 I was soon looking forward for the famed on-board service of Vistara. The first trolley headed towards Premium economy soon afterwards. Ruma came around with the trolley for economy - she explained the contents of the meal service while taking options from passengers. On offer was Paneer Roll in Veg, and Chicken Nuggets in Non-veg. I was handed over my serving of Paneer Roll along with another bottle of water. In an attempt to distinguish between premium economy and economy, Vistara brought in the concept of Box Meals (not a new concept as such). The differentiation being that premium economy passengers get their meals on a tray, while the economy passengers get them in a box. Cutting the crap short, this is what the box looked like. 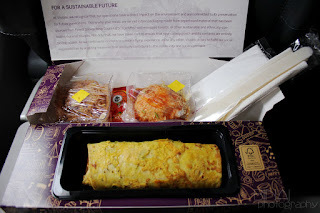 The box contained a warm Paneer Roll, an Aloo-Tikki Chat and a dry sweet made of Vermicelli and Almonds. In addition to these, a sachet of dairy whitener and a sachet of sugar, along with plastic cutlery, neatly packed in "eco-friendly" plastic packing was present. The paneer roll, a kathi roll to be technically correct, was made of wheat paratha, with soft and succulent paneer filling inside. The filling was perfectly cooked - they got the spices correct and perfectly cooked. My only grouse was that the paratha was a bit dry and hard (I guess thats due to re-heating). The Aloo-Tikki chat was good - the pattice was soft, and perfectly cooked. The chaat was prepared perfectly. The sweet was a let down - it was too dry. While the sweetness was perfect for me (I prefer less sweet foods), it would surely be a let down for sweet-lovers. As I finished my meal, the attendant came around to collect the box and gave the option of choosing a hot beverage - I took a coffee. The brew was served in a disposable paper cup - that was one severe let down. Differentiation shouldn't necessarily mean degrading a class to highlight the other! 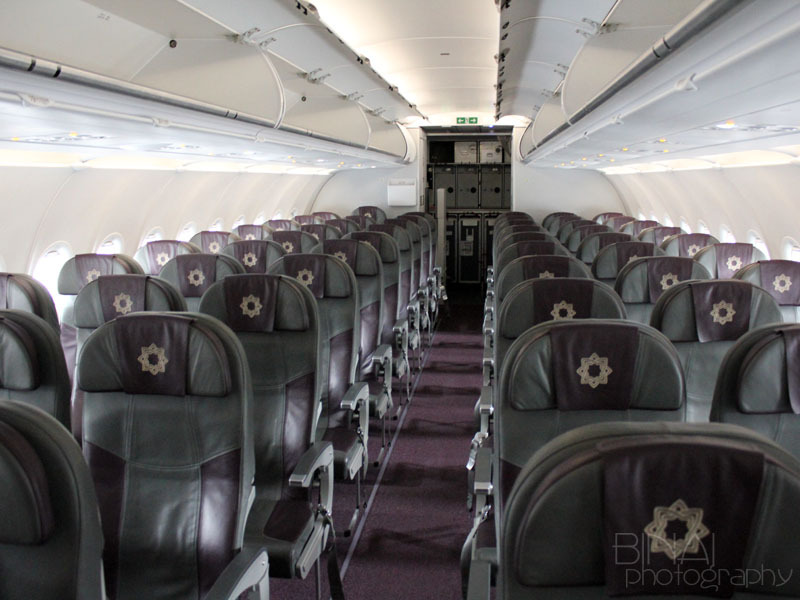 The cabin as it was being prepared for landing.. The attendants gave out another serving of water when they came around to clear thrash. We hit a pocket of turbulence sometime in between, and the seatbelt signs came on at 1040hrs - it was turned off at 1047hrs. 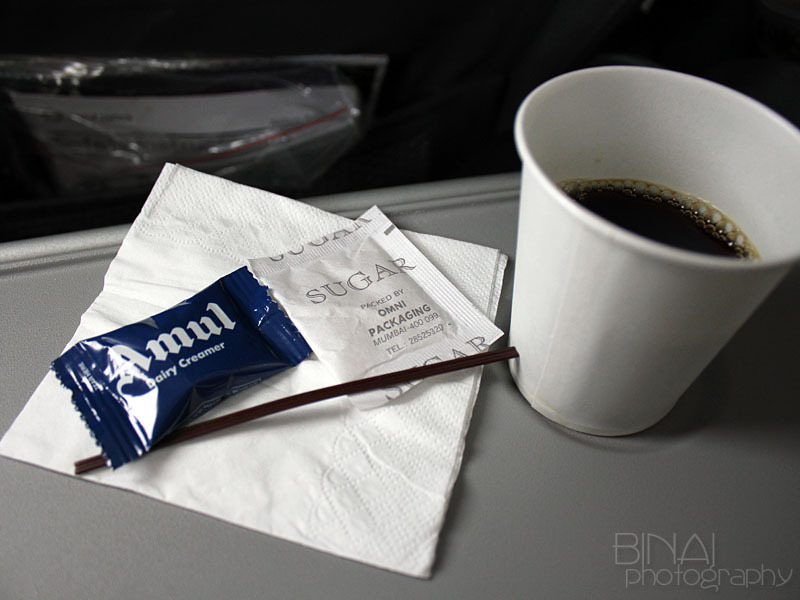 Sometime around 1110hrs, the seatbelt sign came on again, followed by the routine landing announcement. A few minutes later, the commander came on the PA and announced that we would be delayed by 10 minutes due to air traffic congestion. 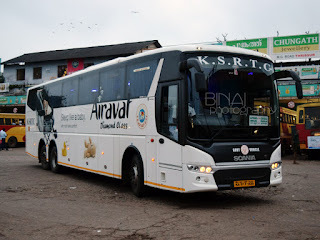 We began drawing patters in the sky now - a tour of Navi Mumbai and Karjat areas were given. However, most of the time, heavy cloud cover meant there was no visibility and we kept jerking around. 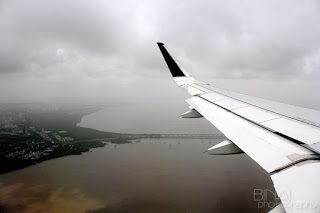 Soon, the "crew to stations" call came and we were soon descending - Vashi came into sight, followed by the Vashi bridge. 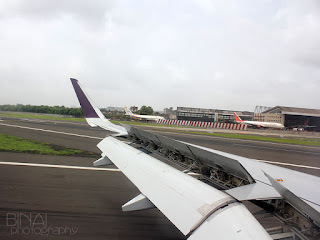 I was super excited by now, we soon descended past Ghatkopar, and flew over Dharavi as we began our final approach to Mumbai's Chhatrapati Shivaji International Airport. We finally touched down on Rwy27, at 1142hrs. 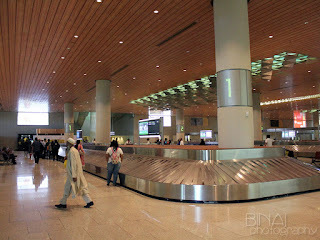 We had a long taxi towards the all new Terminal-2 aka T2. 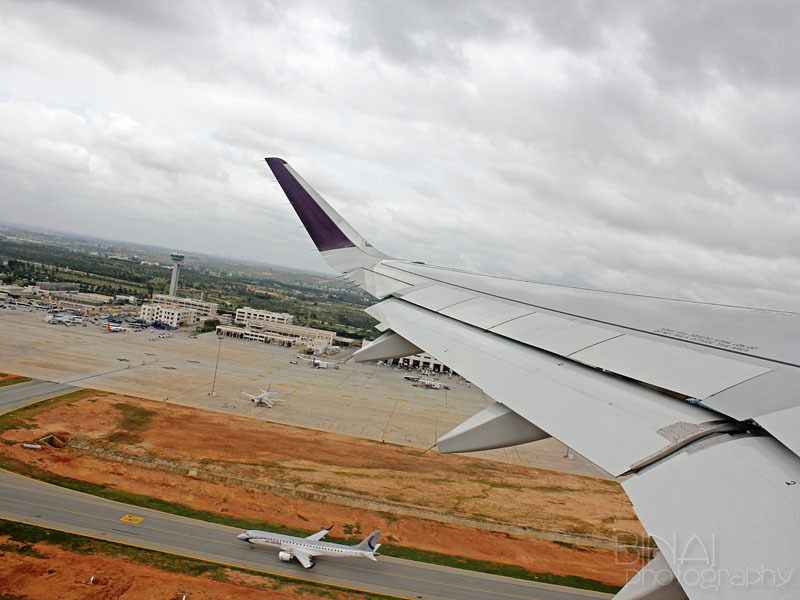 We cut across the Domestic apron, then the alternate runway (14-32) and crawled towards the International apron. We finally parked at a really remote corner of Terminal-2 at 1149hrs. There were no other aircrafts in sight (except a Qatar freighter) - I believe this corner is reserved for Vistara, who happen to be the sole domestic operator to use Terminal-2. I got off the plane 1156hrs. I walked out of the aircraft into a seriously amazing terminal - a very well setup terminal. The baggage reclaim area of Terminal-2 was just amazing - the roof panels, colour combinations, carpeted floor all were like no-other in India. I must say, GVK, has done a seriously great job with re-building of T2. The baggage took quite some time to come - I got my bags by 1206hrs. It was a fairly long walk out of the terminal - the entire area is divided into a dedicated domestic zone. I walked out of the terminal to a very humid Mumbai - back to Mumbai after 6 long years! Epilogue: Vistara is a new full-service carrier owned by a JV of TATA Sons with Singapore Airlines. I must congratulate Vistara for the good show they've been able to put up on the customer front. The flight attendants really personalised their attention - to the extent of helping a couple of old passengers walk with support or answering calls quickly. The annoying factor was the tight seat pitch - It was really tight. 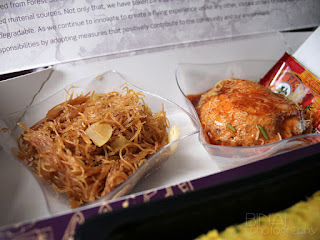 The boxed meal is a great concept, thinking of it from a logistics point of view - but its a messy concept from the passenger's point. The meal selection was awesome - finger licking delicious to be honest. The service was great. 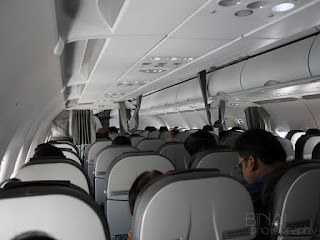 But then, Vistara hasn't been doing great on the occupancy side - their three class concept hasn't really succeeded. Its a good concept - but I am not sure if the present difference between fares between Economy and Premium Economy is worth the extra features. Time will tell! I reserve my conclusion till I travel with them again.